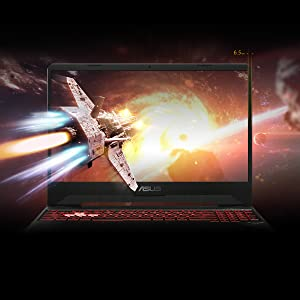 Buy ASUS TUF FX505 Intel Core i7 8th Gen 15.6-inch FHD Gaming Laptop (8GB/1TB Hybrid HDD (FireCuda) + 256GB SSD/Windows 10/GTX 1050 Ti 4GB Graphics/Gun Metal/2.20 Kg), FX505GE-BQ030T @ 17% Discount. The new NanoEdge design has an even thinner 6.5mm bezel for extreme immersion in a much more compact package. FX505 features an IPS-level panel with an faster refresh rate for supersmooth gameplay with minimal motion blur. A sRGB color gamut and wide-view angles ensure vivid and consistent colors, even when you’re viewing it from extreme positions. FX505 has a keyboard that’s optimized for gaming, featuring RGB-backlighting across all zones that can be controlled via the TUF Aura Core panel so you can express your own unique style. Exclusive HyperStrike technology ensures more accurate typing and improved ergonomics thanks to a desktop-inspired layout with a highlighted WASD key group, broader space bar, isolated arrow keys, and recognizable gaps between the function keys. In addition, Overstroke technology provides each key with 1.8mm travel distance for improved responsiveness. FX505 has an extremely durable keyboard with 0.25mm Keycap Curve that can endure up to 20 million key presses. Despite its compact size, FX505 packs the punch of a full-fledged gaming desktop. 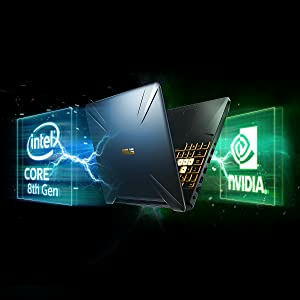 It’s powered by latest 8th generation Intel Core Processor for speed. This latest processor allows for faster, more efficient multitasking, including simultaneous gaming, recording, and live-streaming. FX505 contain NVIDIA GeForce GTX 10 Series graphics for vivid visuals and super smooth gameplay. 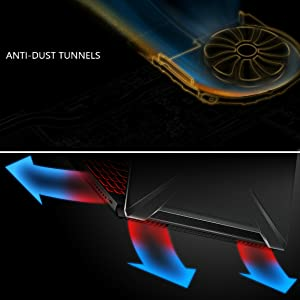 ASUS-exclusive HyperCool technology comprises of the Anti-Dust Cooling (ADC) system and Fan Overboost technology to ensure exceptional cooling during gaming marathons. Furthermore, cooling is also improved by the trapezoid-cut lid and intelligent parallel fan placement. DTS Headphone: X technology delivers immersive, high-fidelity 7.1-channel virtual surround sound for theater-quality audio, even when you’re using a headset. 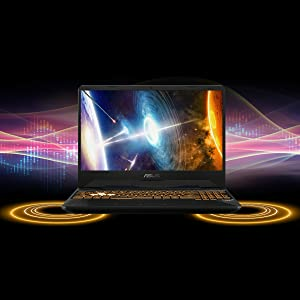 It features optimized settings for games, sports, and movies, and has a built-in equalizer for additional fine-tuning. The 1TB 5400rpm FireCuda SSHD loads games more than 50% faster. FireCuda’s flash memory acts like a cache, saving frequently used data without accessing the hard drive to lower power consumption and improve performance. FX505 pairs its processor with up to 32GB of dual-channel DDR4 2666MHz memory for improved performance and energy efficiency. SFX505 features one of the fastest Wi-Fi standards available the latest Intel 802.11ac Wave 2 boasts. Additionally, the 2×2 MIMO configuration provides up to 30% wider coverage than a 1×1 setup. Stream your favorite movies in high-resolution or play online with fewer connection drops, even if FX505 is farther away from your router. 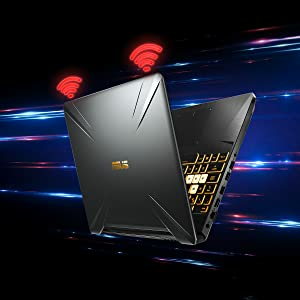 ASUS TUF Gaming FX505 will change the way you look at gaming laptops. It exceeds expectations, boasting impressive hardware and a compact, aggressively-designed chassis that’s exceptionally tough. FX505 has a gaming desktop-inspired keyboard with RGB-backlit keys, a highlighted WASD key group, and Overstroke technology for fast and precise control. With a cutting-edge IPS-level NanoEdge display, and a MIL-STD-810G test certified durability, FX505 delivers an immersive gaming experience without breaking the bank. 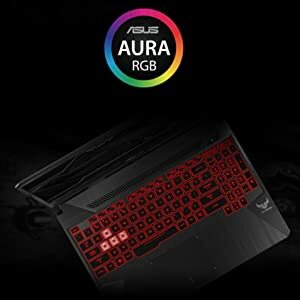 Best Cheap Deals For Asus Laptops, Grab Cheap ASUS TUF FX505 Intel Core i7 8th Gen 15.6-inch FHD Gaming Laptop (8GB/1TB Hybrid HDD (FireCuda) + 256GB SSD/Windows 10/GTX 1050 Ti 4GB Graphics/Gun Metal/2.20 Kg), FX505GE-BQ030T Online.